“How to be?” What if Hamlet had asked that question instead of “To be or not to be”? The right question asked at the right time has the potential to dramatically change how we understand and ultimately act to solve complex challenges. Like Hamlet, the collective global open procurement challenge has all the ingredients for drama: power, money, and vested interests. We know that one actor or action alone cannot turn tragedy into a happy ending. We know that we need a committed group of people who will collaboratively rewrite what many believe is destined to be an unjust, unchangeable story. So in designing Open Contracting 2017, it was mission critical that we ask the right questions. We did not want to organize another conference where the best parts are the breaks and maybe the cookies. Over the last six months an inspired group of open contracting pioneers—the Open Contracting Partnership, Hivos, CoST, B Team, Article 19—have worked hard to define these crucial questions and prepare for next week’s Open Contracting 2017, engaging Reboot as the design and facilitation partner. We asked ourselves: How do you balance the power dynamics between everyone in the room, so that people begin to trust and collaborate with each other? How do you ensure that the event offers participants something relevant and actionable to their individual daily work, while also working toward higher collective ambitions? This is especially important because open contracting is still a new idea. Excitement is high, but there are people who may not yet see their place in this work or oppose it, while others have been living and championing open contracting for years. Our challenge is to bring all of these diverse actors into the same safe and creative space to collectively design a new ending for the current public procurement story. As we get ready to head to Amsterdam next week, we wanted to take a moment to share three key steps that we have taken to advance that goal. Five different organizations are convening Open Contracting 2017. We very consciously decided to co-convene this meeting as we wanted different parts of the open contracting ecosystem to be represented. The planning process began by coming together across these diverse organizations toward one shared goal: articulating a collective five-year vision and plan for open contracting. We also brought in Reboot as our facilitation and design partner. We knew that writing a new play with five authors can be messy. We wanted an experienced coach who could lead us through the process. We wanted to work with someone who would ensure that the story would not be about the authors themselves but about the readers or users. At Reboot, this is our bread and butter—managing complex stakeholder dynamics, taking the time to understand diverse user perspectives, and integrating both into a practical yet ambitious design—whether it be for a public service or a global convening. An event is like any design exercise: It has to be based on the needs and desires of the people who will use it. To define the questions which could drive long-lasting change, and thus Open Contracting 2017, we needed to hear from participants. We wanted to understand what problems they’re facing now. What do they need to deepen and accelerate their open contracting agendas? What would make their work smarter? How could Open Contracting 2017 help them? We sent out a survey and then we also followed up with selected participants to probe more deeply on their needs and interests. Among other things, we found that most participants are hungry for practical, actionable steps they can implement now for wins. They want to learn from their peers how to navigate open contracting reforms through political transitions, use open contracting information for informed analysis and action, or advance transparency and accountability in specific industries, such as infrastructure or healthcare. They also want new arguments and stories to make the case for open contracting—ways they can convince political actors and spread the word with the general public. This research and its insights guided the entire design of the event. In many cases, participants’ stated goals aligned with those of us, the conveners. The main difference was in degree; participants expressed more interest in short-term guidance, while conveners were focused on a long-term vision. But with both of these clearly expressed and with Reboot’s guidance, we were better prepared to create an event that balances both. In designing the event itself, we over and over again went back to our core guiding principles: What are the key questions that we need to ask ourselves collectively over the two days to rewrite the story of contracting? 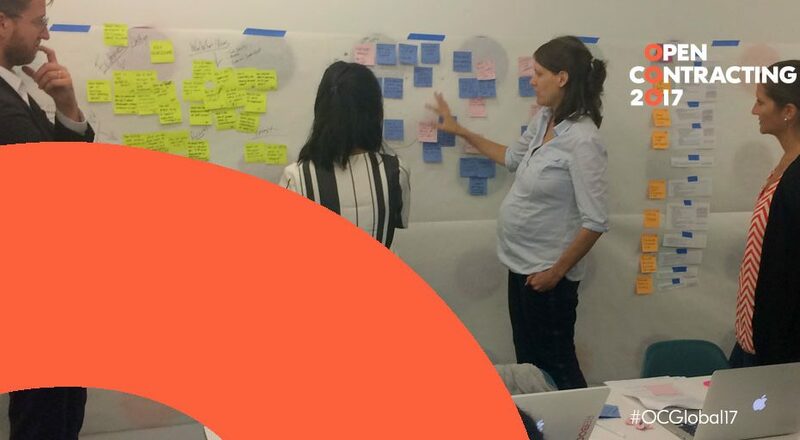 The resulting workshop design offers spaces to ask hard and tough questions, unstructured time for building connections and networking, small group breakout sessions and design exercises. We’ll all be getting our hands dirty, working through tangible problems that relate to our work, and we’ll come back together as a group to articulate our joint vision. Our goal is to build momentum, co-create concrete solutions, and leave feeling inspired. Of course, we need to be ready to change as we go. A conference is carefully planned, but as facilitators, we also have to be responsive and adaptive to the group in real time. Fortunately, we are walking into a room filled with smart, passionate people; we are beyond excited to see what this group rewrites as the story of how public procurement delivers for everyone. As much as we are looking forward to Amsterdam, we know this convening is just a means, not an end. We are committed to continuing the momentum beyond the event itself. Like how Hamlet inspired many other works, we believe that the vision we establish together in Amsterdam will guide years of work and collaboration. We hope this gathering is one that participants will look back on fondly, but we also hope that the “best part”, “the new happy ending” is yet to come in the impact that open contracting has on improving governance for all.